Praveen Rodrigo '20 hit a double-handed backhand to his Peddie opponent. 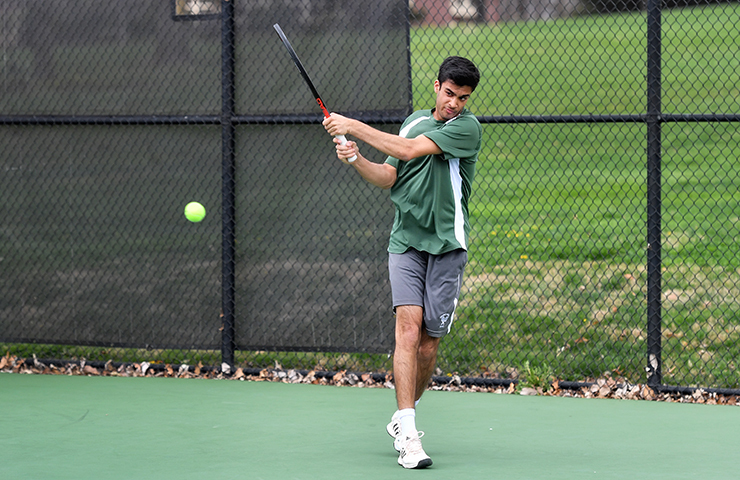 The George School varsity boys’ tennis team started their season with a 4-3 victory over Peddie School in an exciting match played at George School on Tuesday, April 2, 2019. The team’s singles players faced tough competition. First and second singles players, Praveen Rodrigo ’20 and Kairo Morton ’20, battled but lost to steady and talented Peddie players in straight sets. At third singles, Spencer Stockhammer ’20 lost 6-1 in the first set, came back to win the second 7-5, but lost the third set 10-4. At first doubles, Eli Faigle ’20 and Hari Narayanam ’21 found themselves 0-3, down two breaks of serve in the first set. They turned the set around, winning it 6-4. They quickly won their second set 6-1. At second doubles, Gio Restituto ’21 and Satchel Smith ’20 won their match in straight sets. Will Carson ’20 and Charlie Castle ’20, at third doubles, were the first to finish. Down match point, Charlie won the match with an ace served down the middle of the court and a winner drive down the left alley. The fourth doubles pair, Jason Bradley ’19 and Haru Kato ’20 had a comfortable tiebreak lead of 9-4 when their opponents double-faulted to lose the match. The team’s match against Germantown Friends School is scheduled during Alumni Weekend on Friday, May 3, 2019 at 4:00 p.m. at George School.